It’s not every day a digital marketing agency is approached by a nine-year-old girl who needs a website. 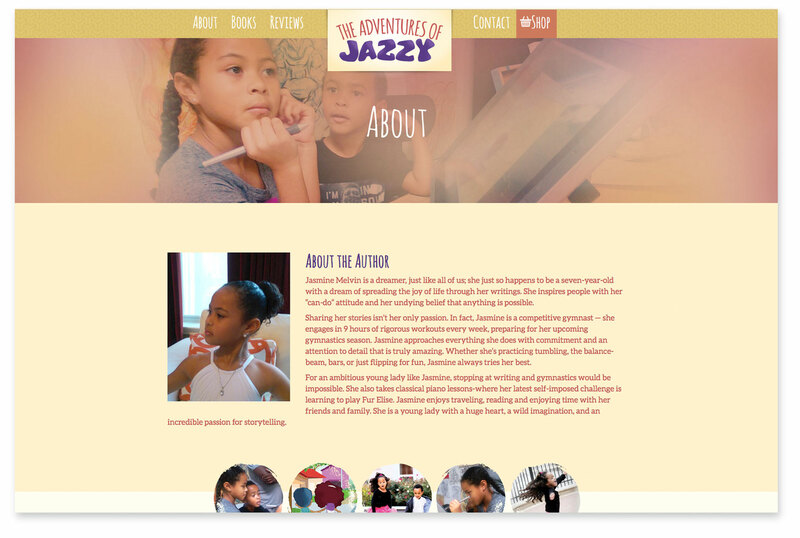 Author, Jasmine Melvin, needed a platform to promote her new book series, The Adventures of Jazzy. She wanted to not only let everyone know about her new book, but also have a website that allowed her to feature and sell each book as she writes them. We designed a simple, yet playful website that represented her brand and put the focus on selling her books and engaging with her audience. 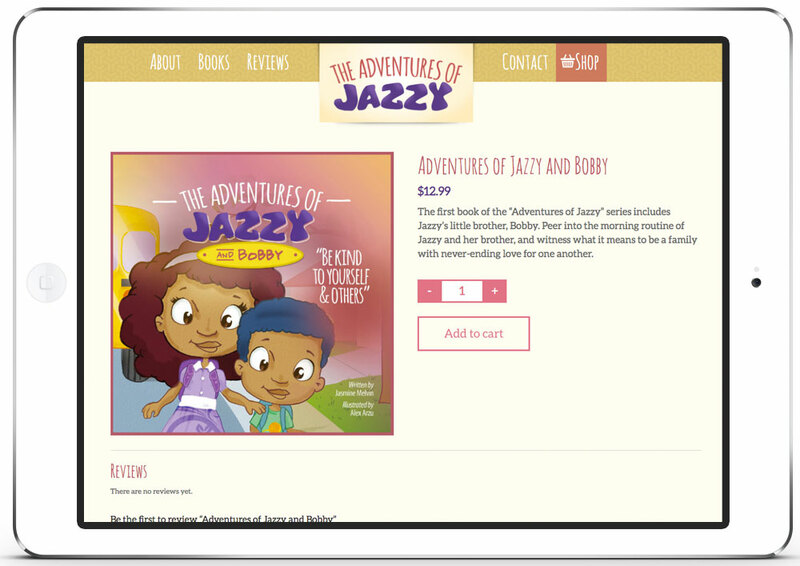 The home page features simple call-to-actions to make it simple for users to purchase their copy of Jasmine’s latest book and learn a little more about the series and what they’re all about. 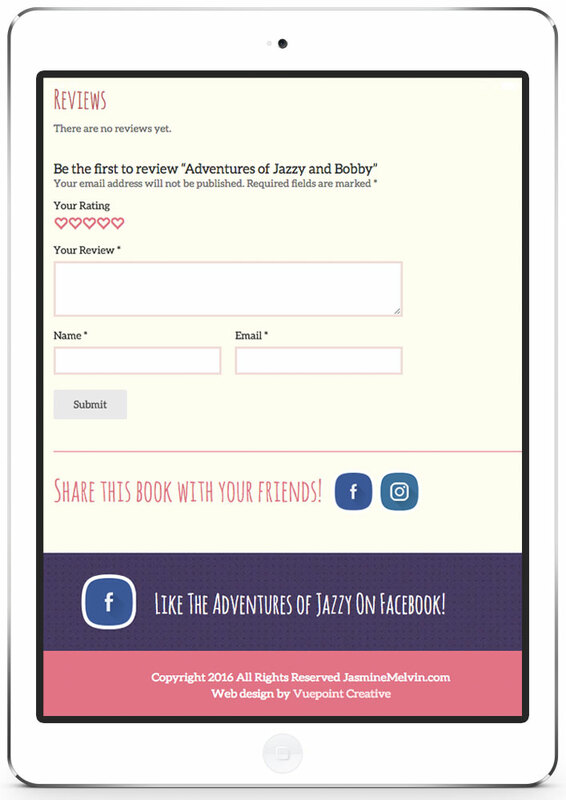 As always, every page encourages the visitor to “Share the Adventure” with their friends and to “Like Jazzy on Facebook”! The “About” page allows fans to learn more about the young lady behind the series, as well as the illustrator she collaborated with. Putting a bio of the illustrator created an opportunity for our target audience to learn about the unique illustrations and gave a behind-the-scenes look at the process. 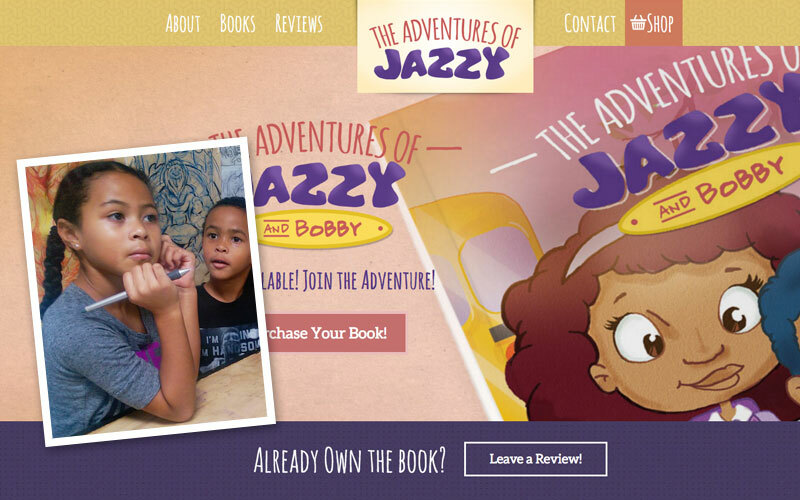 The reviews page is a unique way to encourage each visitor to leave a comment about The Adventures of Jazzy. We utilized the Facebook comment plugin so that with every comment, the word is spread with that individual’s Facebook network. It’s not only an easy way to gain awareness, but also adds a lot of credibility to each review. Fans can even share the love by leaving their feedback on a specific book they’ve read. This also lets customers review feedback on the book before purchasing. 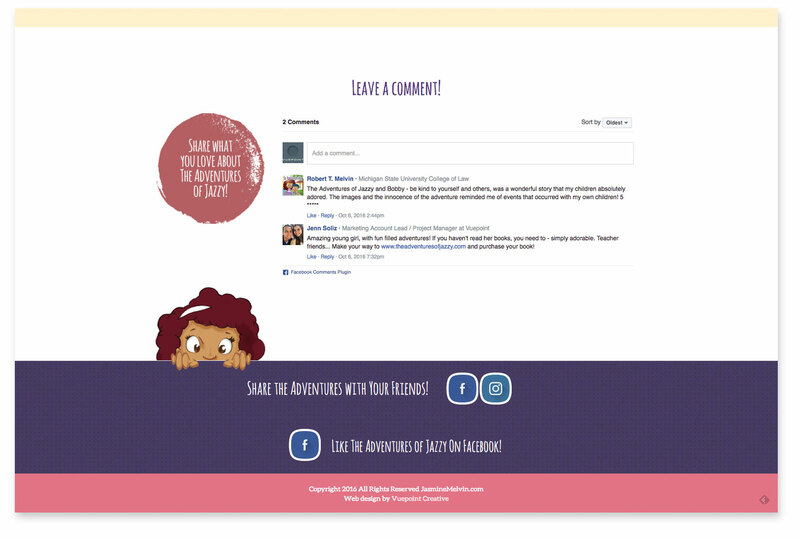 And of course, the ability to share is readily available on every product page! 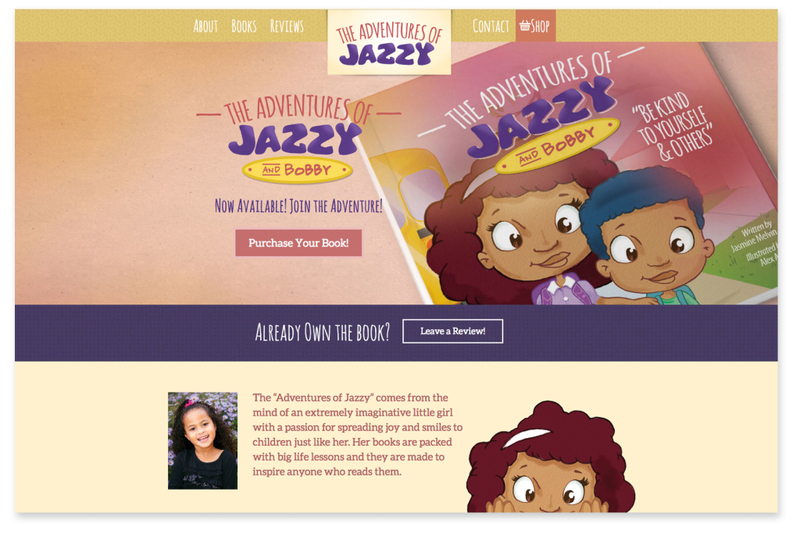 We know that Jasmine has a lot more books in her future so we’ve outfitted her with a website built on WordPress using WooCommerce. WordPress allows the website admin to simply login and add the book cover, price, and description so that her book is instantly available for purchase. We can’t wait to see each new book and how they will evolve as she gets older. This website was built to grow right along with her as she comes out with new books and continues to blog about her adventures. Jasmine has already found amazing success and we are thrilled to have been a part of this unique project.